Nail Polish Christmas Triple French, Merry Belated Christmas! 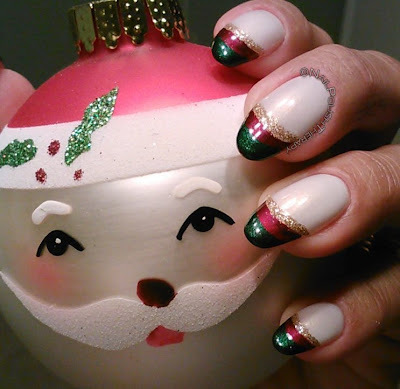 Your Nail Polish Therapist has been hard at work and doing some festive manicures. The collection is expanding and thanks to my wonderful husband I have another Helmer to grow into. He's so thoughtful and knows just what I need. It's probably my favorite gift of all the ones I received. This first manicure I created for my love of the french. 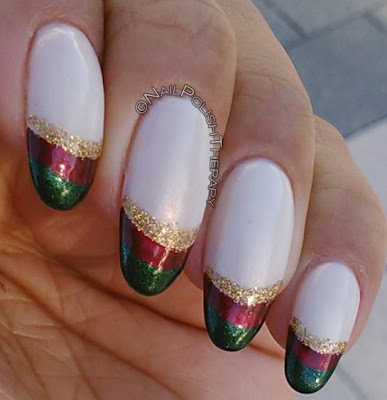 I don't do it as much as I used to and figured it would be a good time to come up with a Christmas version of this classic nail design. 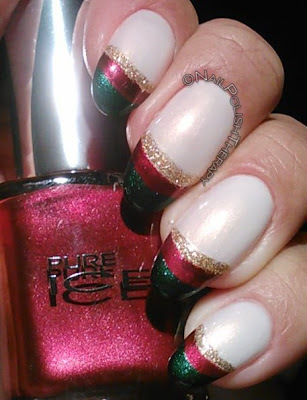 The base color is Love & Beauty Vanilla, the gold stripe is LA Colors Art Deco 24K Glitter, then Pure Ice: All Nighter and the last stripe is Pure Ice: Femme Fatale (from the suede collection). 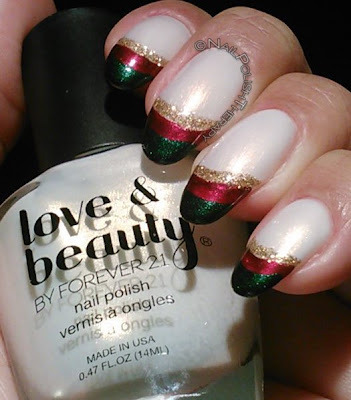 I used these colors because together they looked vintage to me like an old Christmas ornament. I was pretty happy with how neat it came out. What do are your thoughts? Feelings? Concerns?